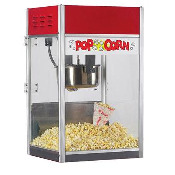 Popcorn Machine - Bounce House & Party Rentals | Inflatable-Kingdom.com Jackson MS.
Every 3.5 minutes results in 8 oz. of popcorn. You know what that means? Instant treats = happy guests. Rental includes serving for 50 guests.